Listen to an Interview With Chris Your browser does not support the audio tag. I decided to practice medicine because I was frustrated with the medical care I received when I was in pain. I didn't feel like I knew what doctor I should see, and I didn't feel confident that the doctors I did see spent enough time to understand what was wrong. When I finally got the care and attention I needed, it was clear to me that there were others who felt just like I did! I have made it my mission to be an advocate for you, my patients, and determine what steps you need to take to improve your health and get to the root of your health issues. My background in Integrative Medicine gives me the opportunity to understand the various mechanisms that are causing your disease and the tools we can use to fix them. I feel extremely fortunate to have found this medicine and I look forward to the opportunity to share it with you! Chris Goddin is a nationally board certified Diplomate of Oriental Medicine as recognized by the National Certification Commission for Acupuncture and Oriental Medicine (NCCAOM) as well as a Licensed Acupuncturist in the state of Texas (Lic. #AC01754). 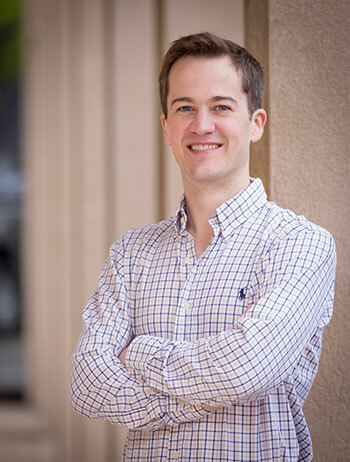 Chris earned his BA in Psychology and Linguistics from Emory University and his Masters in Acupuncture & Oriental Medicine from AOMA Graduate School of Integrative Medicine. Chris is also nationally accredited as a Certified Cupping Therapist through the International Cupping Therapy Association (ICTA) and certified in Mei Zen Cosmetic Acupuncture. From his days as a high school and college athlete, Chris has always been fascinated by the human body and specifically the connections between mind, body & nutrition. Chris began studying Traditional Chinese and Integrative Medicine in 2013 after experiencing debilitating back pain for more than 5 years. After a long journey to finally find a cure to his own back pain that included acupuncture, cupping therapy, diet changes, targeted exercises and mind-body awareness, Chris felt the need to push his learning further and strive to help others be better stewards of their own health. In 2017, Chris received a Master’s degree in Acupuncture and Oriental Medicine (4 year degree, 2900 hours) from AOMA Graduate School of Integrative Medicine. Integrative medicine strives to use the most appropriate therapies and concepts from traditional and modern medicine in order to treat patients as effectively and safely as possible. In addition to his studies at AOMA, Chris has followed his passion for healing through whole foods nutrition and self-care and has done extensive research on these topics to be able to better serve his patients. He has also completed additional training on Traditional Chinese Medicine (TCM) for soft tissue and sports injury with renowned clinician Dr. Yongxin Fan. Chris is a member of the Texas Association of Acupuncture & Oriental Medicine and a member of the American Association of Acupuncture and Oriental Medicine. Chris has a wonderful wife and two young daughters. On weekends you will probably find all of them out and about in the parks and on the trails around Austin, swimming in the summers or otherwise exploring our beautiful part of the world.